Dreamforce is overwhelming enough, but if you enter the DevZone, you would be forgiven for being overwhelmed by the number of options for Release Management for Salesforce. There are a lot of excellent options in the market, each with their own unique selling proposition. This post is intended to help make sense of the market and understand the tradeoffs involved with each option. It goes without saying that this post is written by Blue Canvas so it has a bias. But our goal here is not to disparage any of our great colleagues but instead to help highlight where we are unique to help you ask more informed questions. Blue Canvas is the newest player in the market. We were founded in 2016 right as Salesforce DX was being announced. We wouldn’t have gotten into the market if we didn’t think we could make a radical improvement over what is out there today. With Salesforce DX we now believed the tooling was available to make release management and deployments a great experience for Salesforce developers and admins alike. Because Blue Canvas is built on Salesforce DX you get the benefits of the latest and greatest from Salesforce without having to invest in new tooling yourself. DX is built into our product in a fundamental way. You don’t have to adopt DX alongside Blue Canvas, you automatically get the benefits from DX when you create an account with us. This means that you are set for the future. DX is the long term direction that Salesforce is taking as regards its development platform. By using Blue Canvas you are future proofing your release pipeline. We are also the mostly deeply integrated into Git and other DevOps best practices that exist for other software platforms. With us, you are investing in a thoroughly modern tool chain that leverages the technology shifts that have taken place in the past half decade. Blue Canvas recognizes that declarative changes and code changes are equally important. We also recognize that version control is the core for any proper release management system. So we’ve built a system that makes it easy to bring admins and configuration changes into the DevOps lifecycle. We automatically commit changes into Git branches on save in Salesforce. We are the only platform that does this at scale. This solves the source of truth problem and allows you to have an accurate view of what is present in your orgs. These automated backups then form the basis of your deployments and provide click of a button rollback capabilities. Our customers often improve their deployment speed by 90% by going from 2 or more hours for a simple deploy to just a few minutes. We do this by removing much of the manual overhead associated with releasing. There is a lot of magic going on under the hood to make that possible. But it’s completely abstracted. We automate a large portion of the deployment process so releasing is a delight. Because we do so much automation, we believe our user interface is the simplest and most intuitive on the market. Because we are automatically syncing your orgs in real time, we have a rich history that we can use to help you construct rollbacks. If a deployment should ever go wrong or there is a change you want to “undo” we have a history that can help. You can do partial rollbacks of individual components or full reversions to previous states in just a few clicks. We even allow you to rollback changes that were made outside of Blue Canvas with change sets or if someone goes rogue in production. So much of the DevOps and release management value prop comes around code reviews. Getting a second set of eyes on your Salesforce code drives improved quality. But you also don’t want unnecessary process to slow you down. Blue Canvas has built code reviews, commenting, diffing and permissions into the platform so code reviews become an automatic step in any release. Though we’ve invested heavily in the platform and it is extremely easy to use, we’ve created a proven success model with our Customer Success resources. Every enterprise customer gets dedicated support resources to train and ensure your team is successful. We have over 350M lines of Salesforce code in the system. We help teams of 2-3 as well as 65,000 person organizations manage their Salesforce release management process. We can leverage our past experience to pattern match other rollouts and advise you on what we’ve seen work well in similar environments. YOU DON’T HAVE TO ADOPT DX ALONGSIDE BLUE CANVAS, YOU AUTOMATICALLY GET THE BENEFITS FROM DX WHEN YOU CREATE AN ACCOUNT WITH US. We believe that technology is only a part of a successful rollout. Accordingly, we also focus on the training and human element of DevOps and release management. “Fanatical Support” is actually a core value of ours. You can get in touch with us if you want to speak to reference customers. 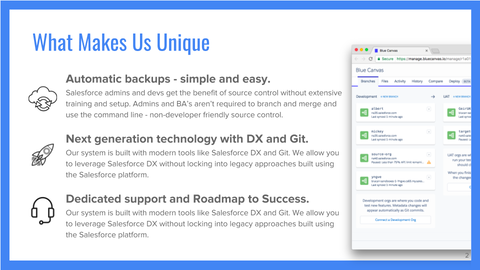 Our two largest differentiators are our modern approach with version control automation and our modern technology stack including Salesforce DX. If you are looking to fundamentally improve your organization’s release pipeline for Salesforce and you want to start with the most modern stack on the market, we think you should check us out.